Allegra Boverman/Gloucester Daily Times. 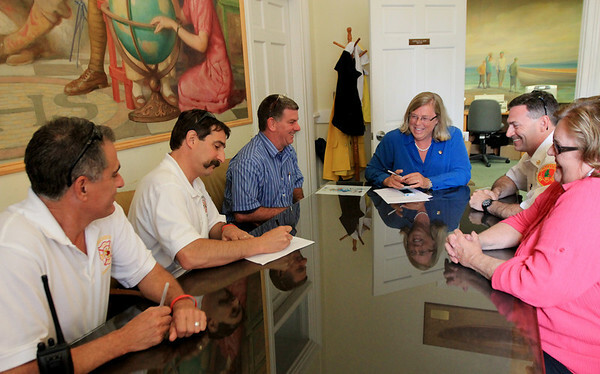 Gloucester firefighters and city administrators signed a three-year contract on Thursday that will restructure the fire department. From left around the table are Deputy Chief Tom Aiello, Capt. Tom LoGrande, Deputy Chief Steve Aiello, who is the union president, Gloucester Mayor Carolyn Kirk, Fire Chief Eric Smith and Personnel Director Sally Polzin.